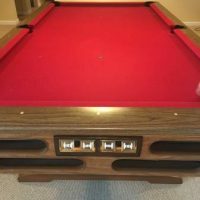 Great pool table by Steepleton. Very nice condition. 8 x 4' Felt in good conditions. Must pick up. Well taken care of nice pool table!!! Leather pockets, 1" slate table, includes all accessories. Pick up only.